At one point in the interview, the prey (Goldberg) captured the hunter (Morgan), with Morgan exclaiming, “I’m not batting for Democrats or Republicans,” to which Goldberg replied during one of Morgan’s rare pauses for oxygen, “If you’re not batting for Democrats, it’s a wonderful approximation of it.” Game, set, match. Here’s another good take from BigHollywood.com’s John Nolte: Exclusive: Jonah Goldberg – Piers Morgan’s ‘Hostile’ Interview ‘Proved the Point’ of My Book – includes video. Here’s a helpful Amazon.com link. Jonah Goldberg also wrote the NYT best seller Liberal Fascism: The Secret History of the American Left, From Mussolini to the Politics of Change , which is one of the best books I’ve read in years. 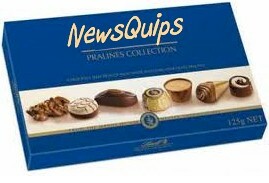 NewsQuips for Thursday Oct 6 2011. Like a box of chocolates.